From a novice to seasoned investor, anyone and everyone can benefit from this. Be it for research, investment or analysis, the contents will help everyone and come with an unbiased opinion coming out of objective criteria. Objective: To get a bird’s eye view on any particular company in an objective manner with precise forecasts. Determines whether the stock is fairly priced, overpriced or underpriced. 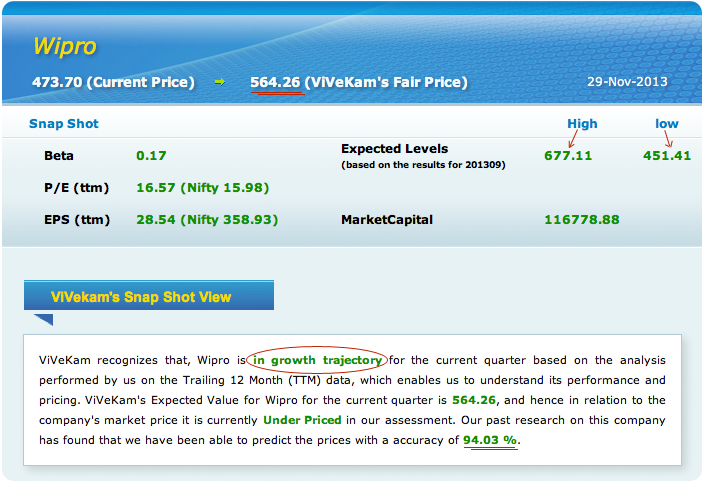 Gives out forecast about the performance of the stock in the near future. One place where all the information that you need for decision making on any stock can be obtained just by a click. Realizing the often felt need to have information on operational performance, price performance, future forecasts, assessment of trends and most relevant Beta for use, ViVekam came up with this service. All values are programmed to be instantly updated as soon as any fresh information is available. Easy to decipher, easier to interpret and extremely helpful in judging the desirability of stock to be in one’s portfolio. In 5 minutes, one will have all updated information about stock’s performance in operations, in market and in relation to Index. You will need to register by becoming a member. Please click on register now on the home page to get check the various membership options and services offered. You can download a sample report by clicking here.